The beast! You can see the chairs in the background. They had a tan, dirty upholstery. Pretty blah. Great detail! Simple and bold. The finish was much rougher than I had thought. I got a workout sanding it! I really like this graphic fabric. It goes very well with the detail on the table. Well that is about it. After hour months we'll finally have this piece out of the garage. 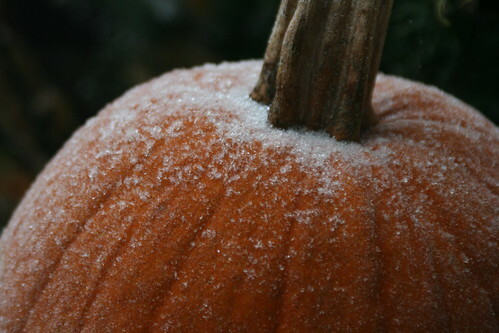 A good thing since frost will be on the pumpkins soon! And I can pull my car in the garage!! Small rocker with detailed painting. It was while I was cleaning it that I noticed the markings on the back. L. Hitchcock, Hitchcock-wille, Conn. Warranted" With the "N"s backwards. I started searching! This one is black and has been restored, but otherwise it's pretty much the same. This one is selling for $450 at www.usedhitchcockfurniture.com I paid $5.00 for mine! This photo is the back said. The front has a door and a cane insert. I think I'm going to girly this piece up. I'm not sure what it will look like so stay tuned. Transformed with brushed nickel spray paint and capping off with the parts that were in good shape. Nothing fancy but I can use this in my staging work to give the appearance of a real bed when used with thick air mattresses. I have several other goodies I've found to work on. I'll share those with you soon! Lucky? Bargain magnet? Nope! I just have learned when, where and how to find treasures. It's really easy. As with many things in life, it's a numbers game. Thrift stores, consignment shops, Craigslist, garage and estate sales are the typical places to find a bargain. I'm always on the look-out for stained glass, old books, pottery and unusual items. I found this small stained glass lamp for $2.99. Silverplate items are fairly easy to find. This is a tarnish free piece that I found for 99 cents at a local thrift shop. This little guy falls under the category of "fun finds." I haven't found another one like this online so far but those I've found (not as cute) are running $23 to $45+ I found this little guy for $1.49 less a 20% discount so $1.20. I don't know that I can give him up. Precious little face! A random chair that I found for $3.99. It's very sturdy and solidwood. I've got it primed and plan to paint it and make a cute cushion. Stay tuned for the "after" of this one. I couldn't resist this little santa mug. It's an old one! Likely from 1920-1930. It was 99 cents. Visit your local thrift shops often! You never know when the leftovers from a large estate sale will be making their appearance! Shop on Mondays and Tuesdays when possible. Most donations are made over the weekend so the new merchandise is placed in the stores early in the week. Look carefully! I bought what appeared to be a silverplate bread plate. It wasn't until I got home that I saw the "sterling" mark on the bottom. It's worth $170 to $250 and I paid 80 cents! I check marks more carefully these days! If it looks interesting, go ahead and put it in your cart. It doesn't take long for other hunters to grab a good item and once it's in their cart, it can't go in yours! If in doubt, buy it. Our Goodwill takes returns so if I decide to return an item I can. Best wishes for successful treasure hunting!! Share your best with me! My husband and I are in Washington State celebrating 11 wonderful years together and to join in the celebration of our nephew's wedding. I thought I'd share our trip with my blog friends. So day one... Pike's Place Market on the waterfront. Listed as a Seattle "must see." We've learned that overcast skies and rain are the norm here. It doesn't stop massive crowds from making their way to the market and once you get there, you see why. The flowers, vegetables, and seafood markets are something to behold. This is the beautiful bouquet Mike bought me. $10! What a deal! They are now beautifully displayed in our room at the bed and breakfast we're staying at. The lillies are starting to open now! Aren't these beautiful? This is the one in my bouquet. Imagine shopping here each day! I think I'd enjoy that! Without the crowds, of course! Believe it or not... there was not seafood smell! FRESH! This is the famous market where they throw the fish but we didn't get to witness that event. We paused for a light lunch at Athenian Inn overlooking the water. Shrimp Bisque with a hummus and pita appetizer. Everything was delicious. We were able to watch the Bainbridge Island Ferry depart. We'll take that on Thursday as we cross Puget Sound to Port Gamble. We are probably heading back during the week when the market is less crowded. Stay tuned for our trip to Mt Ranier!